Wedding celebration, India submitted to ‘Celebrations’ on National Geographic. Kristian Bertel has contributed to the National Geographic Your Shot community with an assignment called ‘Celebrations‘. For this assignment curated by Becky Harlan an associate producer at National Geographic like us to capture a photo of celebrations. This is the time of year when the year ends and a new year have just started, at least if we are on the Gregorian calendar. And in this time of the year people can get pretty fancy when they ring in the new year. But this is not just an assignment about New Year’s Eve, or Chinese New Year or Rosh Hashanah. This is an assignment about celebration and National Geographic wants for this photo assignment to see photographs of occasions that happen every year: holidays, festivals, birthdays, anniversaries – whatever rolls around every 365 days that gets us excited. The curator for this assignment Becky Harlan likes the idea of annual celebrations because she thinks they add both rhythm and excitement to our lives. Celebrations crystalize what it is that makes being alive so beautiful-demarcating what we find important, allowing us to connect to the people around us and relieving us from the doldrums of ordinary time. 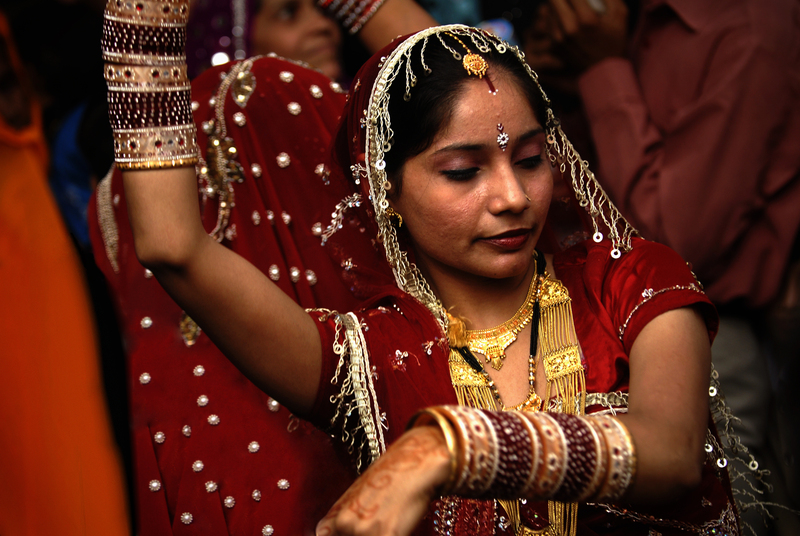 The photographer chose to submit a photograph of an Indian woman dancing to a wedding celebration in Delhi, India. The wedding season in India falls in the cooler period from November to March. During this period you are likely to see at least one wedding procession on the street, with the groom dressed in finery on the back of a horse and a brass band carrying electric lights on modified hats. Marriages in India are filled with ritual and celebration that continue for several days. Usually around 100 to 10,000 people attend. Attendees are frequently not known directly by the bride and groom. Though most Indian marriages are arranged, some couples in urban areas consummate ‘love marriages’, in which the partners decide to marry each other without family involvement or assistance. The traditional Indian wedding is about two families being brought together socially, with as much emphasis placed on the families coming closer as the married couple. Marriages in India are a mainstay in the social calendar of the whole community. Many wedding traditions originated in India. Increasingly, Western features are incorporated, such as speeches, the first dance and the traditional wedding cake. South Asian-style weddings are typically very lavish. Wedding traditions vary across religion, caste, ethnicity, language, region and so on. Traditional Indian weddings are generally structured into pre-wedding ceremonies and wedding day ceremonies. When the marriage has been agreed upon, the father of the bridegroom visits the father of the bride. ”– The day before the expected arrival of the marriage procession, lavish preparations are done by the family to receive the groom in beautiful and decorated venues, typically farmhouses or hotel halls, where a sacrificial fireplace called marhwa is built. Brides decorate themselves with gold and diamond jewellery, apply mehndi to color hands and feet, and undergo various bridal rituals, including wearing bridal lehenga or saree. Bridegrooms typically wear a dress or a designer suit. To complete the marriage, the bride and groom walk in a circle, which is called phera around the sacrificial fire”, the photographer Kristian Bertel says.